The art of damascening was bought in India by Persian craftsmen after Mughal ruler’s invasion in 16th century. Furthermore, the patronages of Rajasthan Kings made this art flourish in Udaipur district. Damascening is the art of the inlay of gold and silver wire on iron objects. It was traditionally practiced by the Sikligar community who crafted functional yet exquisitely ornamented weaponry for the Rajput and Mughal warriors. 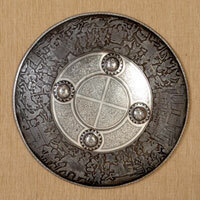 Te-hen-shah work - It is an inlay art in which gold/silver is hammered on the deep chiseled design. It is so smooth that one can’t feel the gold/silver on the iron base. Teh-tula work -it is a kind of overlay art in which we can feel gold/silver work on the objects, they seem like embossed on iron base. It’s really hard to find this work as it was done in past. The variation of punching is adopted by artist to give a similar look. Koftgari work - it is an overlay art which is done by pressing gold/silver wire by special tool on crosshatching and then its heated and pressed by a polish hakik stone (no normal stone is used). This is an art of damascening that is currently practiced and found in India. 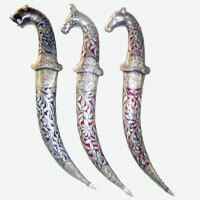 Beautiful handles are made for daggers (katar) in the shapes of different animal’s head and the blades resemble famous Damascus steel from where the name originated. Hunting scenes were engraved or inlaid on outer covers. The artisans possessed great skill in inlaying Arabic inscriptions. The curvature of Arabic letters required precision, for a variation in the curve could change the meaning of the message. In this technique, the surface of the metal object to be ornamented is evenly scratched to create a rough, finely lined surface, heated on a stove until red hot and then allowed to cool naturally. The object is clamped in a vice and the process of embedding wire into the metal is begun- silver or gold wire is laid on the abraded metallic surface and pressed; the wire is further flattened with the aid of opni or moonstone. Larger areas such as the tip of the dagger are executed in silver or gold leaf.